Human beings are guided by internal systems and organic clocks that help to govern and control our bodily functions. These systems also directly affect our spiritual well being and our physical fitness and health. Ancient traditional medicine practitioners carefully observe the placement and movement of energy through our bodies in a 24 hour cycle. Within this cycle, the clocks and programming in our bodies devote certain amounts of energy to certain areas. If you have a habit of waking around the same time every night while trying to sleep, it could be an indicator that some of your energy is being blocked or diverted to the wrong place. This disrupts our body’s rest and hurts our ability to recuperate. Organs need energy to heal and work properly. Below is a list of times and organs they are associated with. Many of these blockages can cause visible outward changes, both emotional and physical. You should pay attention to your diet, what is going into your body in general can be cause for dysfunctional energy placement. This is probably the most common time for people to go to sleep for the night. This is when our enzymes replenish and our endocrine system, which manages hormones and metabolism, rebalances itself. If you repeatedly wake at this time, you may be caught in a “fight or flight” cycle. Not only are you still reliving the events of the previous day but you are already preparing your stratagem for the day ahead as well. You need to use this time to meditate on and repeat positive mantras. Be sure not to eat too late in the evening as it may also be causing these blockages. If you often wake during these hours of the night, it may be due to grudges you’re holding onto or resentments you carry. At this time in the cycle, your Yin energy is being converted into Yang energy. Yang energy is vigorous and lively and it is meant to be stored for the coming day. Work on reinforcing your self love and appreciation, try to stay calm and release feelings of frustration and anger. During this time the gallbladder is working hard to break down fats. You may be ingesting too many high fat or high oil foods. These hours are a crucial part of the body’s renewal process. This is when your organs are detoxifying and cleansing themselves. Your liver does the most detox work of all the organs, while restoring you with new blood. 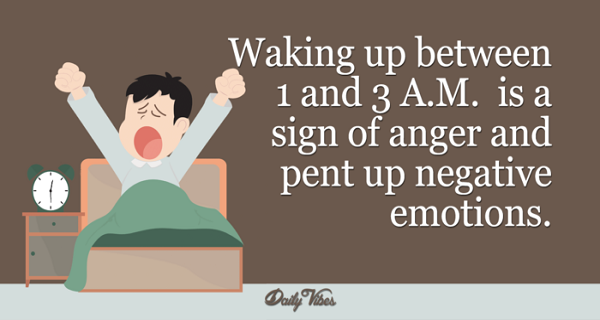 Waking during this time is a sign of anger and pent up negative formations. If you are not properly and healthily addressing these formations, your spirit is trying to call attention to the need for detoxification. Try to release the negativity in your life so you can make room for better things. This is when your lungs are repairing themselves and bathing your body and organs in life-giving oxygen. It is important that you are warm enough to facilitate the healing. Problems with the lungs are usually related to grief, loneliness and sadness. If you wake during this time, try slow and steady breath techniques while meditating on warmth and light. Let the positivity wash over you. Any rogue toxins still wandering the bloodstream will be cleared out of the system at this time. The large intestine is the closer of the organs, restoring itself in the early morning. If you find yourself waking consistently at this time, your diet is the likely culprit. Cleanse your diet of artificial products and replace them with real, nutritious, fresh foods and form a healthy meal routine to stick to. Hydrate yourself regularly with mineral rich water.